On gas stove was necessary to keep 233 °C (451 °F) for 10 minutes to have absence of GIP detection. In range 190-200°C (374-392°F) incubation for 30 minutes was needed to have absence of GIP detection. Tests in temperatures below 190°C (374°F) showed presence of GIP at 10 and 20 minutes. On induction stove temperature up to 246°C (475°F) for 6 minutes was needed to have negativity to GIP. Lower temperature ranges in spite of extended time up to 30 minutes were unable to get negative GIP. In oven processing never was got negative GIP signal, in spite of processing up to 210°C (410°F) and extended incubation time up to 45 minutes. This guide will help you to understand and prevent gluten cross-contact. We often use the term “gluten cross-contamination” when speaking with foodservice professionals about the preparation and handling of our gluten-free foods. Cross-contact and cross-contamination appear to mean the same thing, but there is a subtle difference according to the FDA. Cross-contamination is a commonly used term for allergens. However, allergenic proteins are a normal component of food and not considered a contaminant. Based upon this definition, the agency began differentiating the conditions two years after the Food Safety Modernization Act (FSMA) of 2011 became law. Let's explore the differences a bit more. Cross-contamination happens when biological contaminates (bacteria or viruses) transfer from one food (or surface) to another. 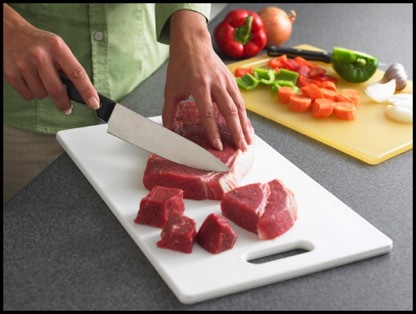 Example: using the same cutting board & utensils for raw meats and ready to eat ingredients). 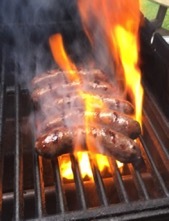 Killing bacteria by heating the food to a recommended temperature makes the food safe to eat. Of course, we know this is not possible for gluten (or any allergenic proteins), however using improper terminology will give the wrong impression to a foodservice professional. Cross-contact happens when allergenic proteins transfer from one food (or surface) to another. Example: using the same cutting board to cut gluten and gluten-free bread. While we expect our food to be biologically contaminate-free, cross-contact is what we're concerned about with gluten. Using the appropriate terminology with foodservice professionals will clearly and accurately describe our needs. Snacks must be poured out into an individual bowl before any cross-contact. If 100% gluten-free buffet-style isn’t possible, separate gluten-free foods from the gluten-full foods. Color-coded containers & utensils help lessen the cross-contact risks. Have a “Gluten-Free” sign posted. Food Allergy Research & Education (FARE). How much gluten is coming from cross-contact?